I can’t let March go without writing this… New Thought deserves a very special place in Women’s History. Did you know that New Thought was the first church to have women ministers? Did you know Emma Curtis Hopkins was a leader in the women’s movement? One reason I was attracted to New Thought in the first place was that women had an equal voice and there were a so many women ministers in our churches. Recently I read that since the beginning of time, women have been more interesteed in religion than men are. I don’t know if that is true but I do know that I’ve never attended any church anywhere when there weren’t more women that men in the pews. Nevertheless, I’m almost positive we remain the only denomination with more women than men behind the pulpit. New Thought was started in the 1880’s when the women’s movement was gaining steam but the real reason we allowed women equal power in our churches is because of what we teach – our basic theology. We define God as Creative Intelligence that is present everywhere, and is all powerful and all Good. God is not an old man in the sky fighting a big battle with a smaller man in a smokin’ red suit from down below. God is neither male nor female but encompasses everything. Since God lives fully present in each of us, we all have equal access to the Power For Good and we can all use it. Women have been the leaders in our teaching since the very beginning. 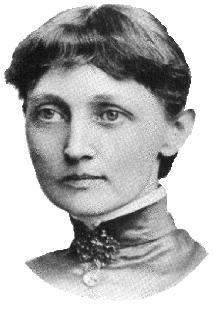 One early leader, Emma Curtis Hopkins (1855-1925), is credited with being the founder of New Thought by many scholars. I am in that camp. I believe Hopkins was the true founder because she clearly articulated the ideas of the teaching as religion and her writing is still taught in our churches. Others say Phineas P. Quimby who learned about Anton Mesmer’s early hypnotism and experimented with the principles of mental healing was the founder, but although he believed in mental healing, he did not believe in organized not religion. It was his student, Mary Baker Eddy, who combined his mental healing techniques with religion and who founded Christian Science. Her churches are not considered New Thought. Emma Curtis Hopkins was a former school teacher who was a divorced woman with health and financial problems. Hopkins studied with Eddy and split away to form her own teaching. Over a period of years, she built a wide-spread work and earned the title, Teacher of Teachers. She taught thousands of people including the founders of the three major New Thought denominations; Unity, Divine Science and Religious Science. She also taught Anna Rix Militz who founded the California-based Home Truth and many others who founded large works at that time. Emilie Cady was in Hopkins’s first class and Cady is author of the famous Unity text, Ten Lessons in Truth. Later Hopkins taught Unity founders Myrtle and Charles Fillmore . She also taught Malinda Cramer, and the other founder, Nona Brooks, learned from a student of Hopkins. Ernest Holmes, founder of Religious Science, studied with Emma Curtis Hopkins later in her life. I have always been fascinated by Hopkins and her colleagues because they lived in a time when women were pushing for the vote and for equal opportunity. Most of these New Thought pioneers were divorced or widowed women who travelled from town to town, staying in people’s homes and teaching any beginners they could attract. They were truly very brave. Some of them, like Hopkins, were charismatic enough to draw big crowds (as much as a thousand) and even start schools. Others labored in the vineyards with little notice, crisscrossing the nation by railroads and opening minds and hearts. They were teaching philosophy and religion in a time when most women worked at uneducated, menial jobs and/or housework. They were harbingers of the New Age of Women. Some, like Helen Wilmans and Hopkins, were active in the Women’s Movement and others were simply active women. Wilmans was active in the labor movement as well as creating a mail order books, lessons and distance prayer business in the town she built in Florida. She was hugely successful for a while and known as a political activist as well as a prosperity teacher. No one knows much about her today. Emma Curtis Hopkin’s fame remains but people don’t know she taught leaders of the Suffrage Movement. Of the 22 graduates of in her first graduating class, 20 were women. One was Helen Wilmans. Two others were the very active, well known suffrage activists, Louisa Southworth and Elizabeth Boynton Harbert. What’s more, Hopkins Metaphysical Association had a booth in the Women’s Pavilion of the 1893 Chicago World’s Fair! Over the years, I have heard many comments bewailing the lack of men in our churches (mostly from women). Almost no one comments about the wonder of having so many fabulous women leaders. We need to look at that and pay more attention to our history. While the Christian Science and Seventh Day Adventist Churches were American religions founded by women during the same era, those leaders who the founders were male. Our leaders have included both genders throughout our history. The first president of the International New Thought Alliance was the noted writer and magazine editor, Elizabeth Towne. Some people know that Quaker women played a leading part in the struggle for women’s rights but not many know that New Thought women were also involved. Other people associate the Unitarian-Universalist Churches with social action and that is certainly true. It is also true that they had very few women ministers until the 1960’s. Both Unitarian and New Thought teachings are descended from the Transcendentalists and we both claim Emerson as one of our ancestors. I am also very proud to also claim early feminist, Margaret Fuller, first editor of the Transcendentalist magazine The Dial as my ancestor as well. Unitarians and the Quakers have been well known for their social activism, while we have been quietly making history for the last century and a half. When I began studying Religious Science, the President of Religious Science International was a woman named Earlene Castellaw. Dr. Arlene Bump was president later. The Rev. Dr.Cathy Hearn headed United Religious Science for many years. I believe New Thought people should be very proud of our women’s history heritage and make it known. I still have a few copies of a book I wrote ten years ago. I plan to rewrite one of these days and add more about these ideas and new facts. Meanwhile, contact me if you are interested. The book is called New Thought – New Woman, a survey of Women and Spirit from Goddess to New Thought. Why was I led to this teaching? How do I feel about a majority of women in my Center? Am I proud of our New Thought history? Do I have friends I want to tell about our history? “ I wanted to write that, but he beat me to it,” a friend says. Soon after, another friend claims, “I had that idea before anyone else.” As I look at my own life, I see that many ideas I believed were original were actually part of a cultural shift. The more I look at how ideas develop, the more I believe that it all comes from the same Creative Source that we call God. Ideas seem to come into being when the time is right and they often develop in multiple strains, out of multiple people’s minds, in multiple places. At some level, we all acknowledge this. We say, “Great minds run in the same direction,” because it seems to be true. One of the best proofs that the ideas come into being when the time is right is the phenomenon of simultaneous inventions. Thomas Edison was the inventor of motion pictures unless you are French and then you probably believe it was the Lumiere family. Some people believe that one must have stolen from the other but it is quite likely the invention occurred because it was time for it to appear. It is now common for the Nobel Prize to be awarded to more than one scientist for simultaneous discoveries. Ideas of science, philosophy and religion can definitely have multiple origins and be very similar. The Reformation began in Germany but England’s reformation was more simultaneous development than it was Lutheran in origin. Divine Science, which is part of New Thought, was started at the same time in Colorado and San Francisco. When Nona Brooks and Malinda Cramer met, they joined forces because they were doing the same thing at the same time. Those two women were smart enough to cooperate rather than let their egos rule them. New Thought leaders, in general, are able to rise above their egos; they are not afraid to share ideas. They do their work and share their ideas without a lot of proprietary interest. Since we believe that it all comes from One Mind, we are grateful to be in the flow. Ego self may want to believe it is “mine” but in the light of the teaching, that can’t really be true. Since New Thought beginnings, there were many people who wrote and taught ideas of self-reliance and mental healing and they called their movement many different names. Divine Science, Christian Science, Unity, Church of Truth and Religious Science were some that survived long enough to make the history books. The founder of Religious Science, Ernest Holmes, wrote a very complete textbook that approached New Thought as a philosophy as well as religion. His book, Science of Mind, is filled with quotations from the Bible, RW Emerson and other Transcendentalist writers as well as many other sources . It is most impressive but he did not claim absolute originality; he was very clear that he was a synthesizer. He said his work was based on enlightened teaching of the ages. Often, people who come to Religious Science churches for the first time, are amazed to find a religion that teaches the ideas about the nature of life that they already hold. You can believe that it is because the ideas are practical and logical or you can believe Holmes caught the wave of the next great development in the evolutionary experience of humankind. Alcoholics Anonymous is another powerful self-help teaching that developed at about the same time as Religious Science. The ideas of AA and SOM are very similar in some ways. Both emphasize the individual’s ability to take charge of his life through small, consistent steps. They both are based on spiritual realities. One of the reasons New Thought and Alcoholics Anonymous are similar is that they originated in the United States where we already had a strong tradition of self reliance. We do not look to the elite or powerful to tell us what to do or think, we look to our inner voice to guide us. Many of us have found both AA and SOM to be two wonderful organizations that help us change our thinking and change our lives. The concept of living one day at a time keeps me sober and it keeps me spiritually grounded. The concept of small choices adding up to big answers keeps me consistently on track and it produces great changes in my life. If I had been born in an earlier time, AA would not have been there. Nor would Science of Mind. They arrived on the scene in the late 1920’s and 30’s just in time to lead me into the light. What about you? Do you know that your small choices are building your life a day at a time? Do you know that this is the day in which to happy? Next time you make your gratitude list, you might begin with the fact that you were born into these enlightened times. I have seen a lot of changes in my lifetime. Most of them have been helpful and I am filled with gratitude that I have moved into a personal belief system that allowed me to take charge of my life more completely than I originally believed was possible. I used to think my journey was an original one but now I know I am part of a great wave of positive thinking. The fact that just about everyone knows about my two organizations doesn’t mean they are old fashioned or outdated. It means they arrived at the right time to become accepted truths for many. Ideas about equal opportunity are simultaneously inventing themselves in our lives right now. The possibility thinking that is personal is also cultural and it is spreading. As a woman, I am very aware of the difference in opportunity fifty years ago and today. I am grateful for the changes that have already happened and the ones that are coming. Equality of opportunity is springing up in many places. This is an idea whose time has come. Look around at the various groups who are speaking up about their civil and personal rights. Gay rights. Minority rights. Immigrant rights. Native American rights. Disabled people’s rights. 99% rights. Prisoner’s rights. What small choices shall I make today? Do I see myself as unlimited opportunity?